The Incoming Webhook Extension is used to hold entries on a step until a trigger is received from an external application. IMPORTANT: This step should only be used if the server has an SSL certificate installed as the API Secret is sent on every request. Select Incoming Webhook as the step type. Enter a name for your application. This is just informational. Enter a unique API Key or accept the default value. The API key is used to authenticate each request. This value should generally not be changed after saving. Warning: if there are any entries on this step then changing this setting will result in the entries getting stuck in the workflow and unable to proceed. Enter a unique API Secret which will be used to authenticate the request. It's good practice to change this secret periodically. Determine if you want the step to map any values from the incoming request into field values in the entry. Once an entry hits an Incoming Webhook step it waits until an authenticated request is received. Version 1 and 2 of the Gravity Forms Web/REST API are supported. As of Gravity Flow Incoming Webhook version 1.1 the step settings include an option for Field Mapping which opens up many more potential integration options for Gravity Flow. If you are familiar with the Outgoing Webhook step setup you will find this new setting very familiar. The default (None) will process the workflow onto the next step as soon as a valid request is received. 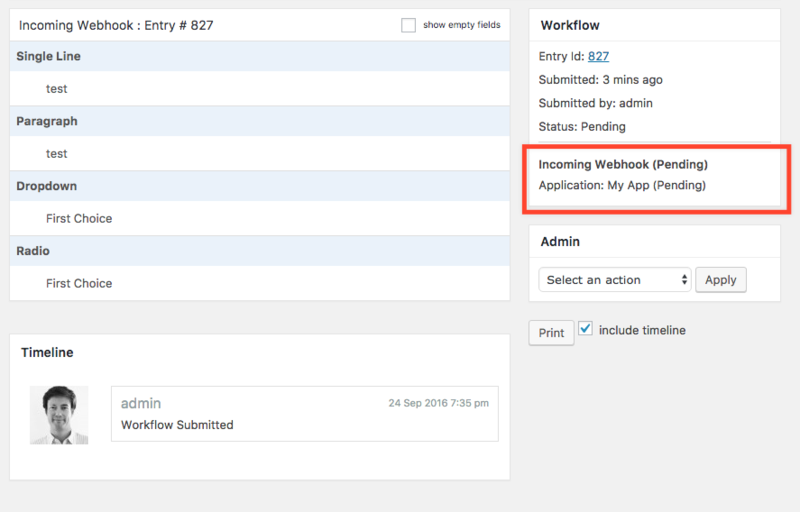 This is valuable when your entry workflow only needs to know that a 3rd party system (or other form using an Outgoing webhook step) has completed a task before proceeding. 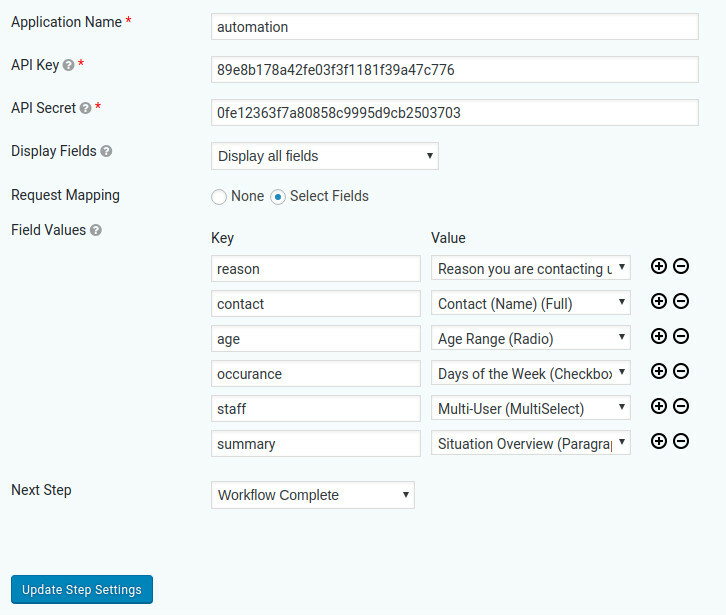 The new setting (Select Fields) lets you define a field mapping between a request key and entry field. When a valid request is received containing data in the body as either form-data or application/json, the mapped field values will attempt to be stored into the entry. This enables 3rd party systems which have updated data for the entry can pass it in via the incoming webhook step. The system which is sending data to the incoming webhook step in one of 3 formats. In all cases the workflow-api-key and workflow-api-secret must be included in order to authenticate the request. All incoming request values are sanitized based on their field type regardless of whether you use version 1 or 2 of the Gravity Forms Web/REST API. This prevents script injections and other technically bad data from being submit through the incoming webhook step field mapping to your form entries. However, it does not validate the request values submit for required status or format. - WOULD prevent "<script>alert('Doing bad things')</script>" from being stored to DB in a bad format. - WOULD NOT prevent "Banana" from being stored. 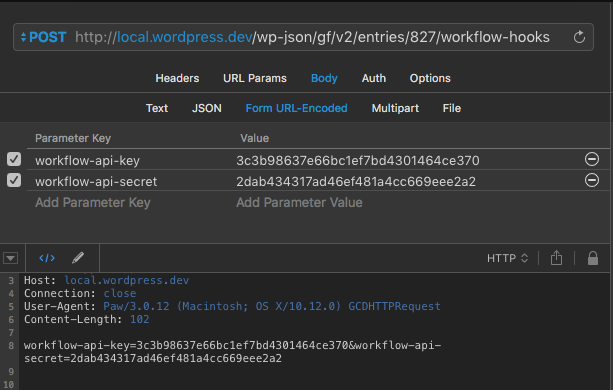 If you need the API / step to validate request values, or source, it is suggested you use version 2 of the Gravity Forms API and refer to the WordPress Rest API Handbook on extending the API or helpful blog posts on validating options with it. Some field types that can have multiple selections (ex. checkboxes) or do have sub-fields (ex. address) can have a request values mapped to the entire field or individual data elements. The following step settings field values and JSON show how they could be set as part of a raw JSON request. The majority of field types in the standard, advanced and workflow sections of the form editor are available for request mapping. A few, listed below, are not available at this time. Please contact us if you have a use case that would benefit from them being added to a future release of the add-on. Postman is an API test wondertool! After importing the collection to Postman and making a few small changes to tailor to your test environment, you will be able to make the incoming request and complete the workflow. How to setup the demo in your local environment? Download webhook-demo-helpdesk.zip and extract on your local PC. Access your test environment and use the Forms > Import section to import the gravityforms-export-webhook-demo.json file. The new form will be named "Webhook Web Help Desk". See Gravity Forms instructions on importing forms if needed. The demo is setup with webhook URL pointing to a requestbin that should respond if you don't make any changes but limits your ability to see the request/response information of the outgoing step if you do not update to match your test environment tooling. See requestb.in for more setup info or should the demo fail in your environment during the outgoing webhook step. Preview the form and create a test entry. Note the entry ID which is displayed in the confirmation screen. Submit an incoming request via whatever API call method you prefer. You will need to modify them to change the change the domain (local.test) and the test entry ID (6) to match your environment / test case. 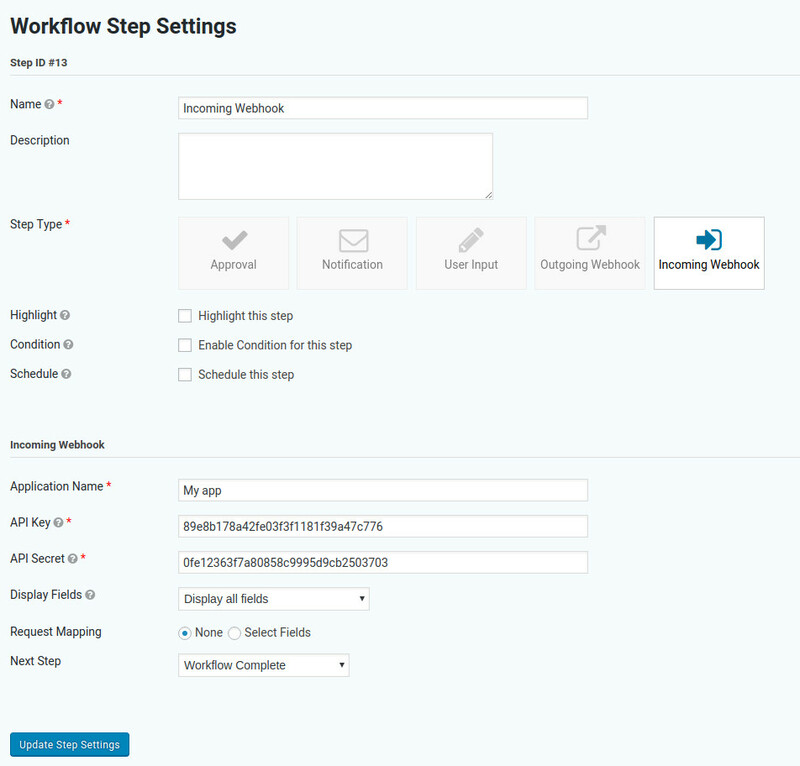 Access the Workflow Status page to see that your entry workflow has been completed and the resolution, status and discussion fields updated.